I often get asked what side of Wallowa Lake is a specific home on. And, being a born and raised person of Wallowa County, I have had to readjust my terminology from the Foot of the Lake and the Head of the Lake to more specific North, South, East, and West sides of Wallowa Lake Oregon. If a home is at the North end of Wallowa Lake, (Foot), this is the side of the lake that has a really spectacular view of Wallowa Lake and Mount Joseph and the Eagle Cap Wilderness. I often say that if you don't want to be at the hub bub of the activities, but want to appreciate Nature's Work, this is the side of Wallowa Lake that you should try and stay on. 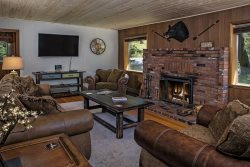 If a home is at the West side of Wallowa Lake (more of the Residential, READ: QUIETER, section), I often tell people that this is the side of Wallowa Lake that you will want to bring your boat, fishing pole, or life jacket and just settle into a slower pace. Since there is no road that connects the West side to the South end, you will have to drive back into Joseph Oregon, and around Wallowa Lake to get to the South end (where the activities are). This side of the Lake has more locals, more summer full time residents, that are here to enjoy, relax, and they will gladly welcome you to their side, if you can slow down, (mentally and on the gas pedal), and experience what it would be like to live here for 6 months even though you may only be here for less than a week. The South end (Head) is the Wallowa Lake resort side of the Lake. This is where the majority of our Oregon vacation rentals are located. The Wallowa Lake resort side of offers shops, restaurants, loads of deer, Wallowa Lake Tramway, and kid friendly activities like go carts, mini golf, horse rides, bumper boats, and arcades. This is a good side of Wallowa Lake lodging for families with kids that want to walk to the activities. This is also where the Marina is located for all of your boating and Wallowa Lake fishing advice! The East side of Wallowa Lake is where you will drive so there aren't any lodging options here, but plenty of wide spots to turn off and enjoy that incredible view of the Mountains, or perhaps the person trying to waterski for the first time! We also have properties located within walking distance of Joseph, Oregon. Need help picking the perfect home and area for your vacation? Just give us a call! We'd love to help you pick! Whichever side of Wallowa Lake fits your families needs, we have a home for you. So, choose a side and then choose your dates, and then choose us! We will help you find the perfect home for that much needed family vacation!